I heard a great quote the other day from Prairie Home Companion’s Garrison Keillor: “The best pumpkin pie you’ve ever had isn’t that much different than the worst pumpkin pie you’ve ever had.” In a few days, you probably won’t want to see it again for quite some time. 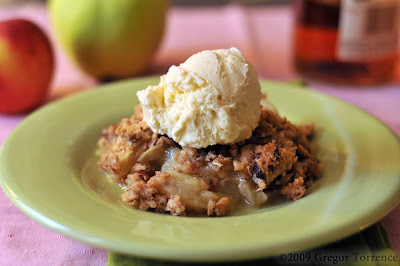 Thus, this week I give you another wonderful, autumn-errific dessert to follow up your cozy holiday feasts: Hazelnut Apple Crisp with Calvados. Calvados, if you’ve never enjoyed it, is a distilled apple cider brandy from Normandy (the French region renowned for its apples) that is aged in French Oak barrels. It is a strong eau de vie that is good as an aperitif, but is even better when paired with pork dishes and apple crisps like this one. The brandy-meets-caramel-meets-apple cider flavor of Calvados enhances the tart granny smith apples and the sweeter honeycrisp apples in the base of this not-too-sweet dessert, so it’s really worth seeking it out. For the crumbly topping, I use rolled triticale flakes (a wheat/rye hybrid) because they add a nice texture and more substantial flavor than rolled oats. Toasted hazelnuts add a buttery crunch, but if you’re allergic, it’s fine to leave them out. If you happen to be vegan, use ice cold Earth Balance buttery sticks instead of butter and proceed with the recipe as directed. Preheat the oven to 375 degrees F. Spray a 10 x 6-inch or 8 x 8-inch baking dish with cooking spray. 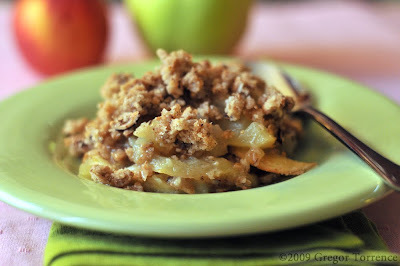 Toss the apples, Calvados, 1 tablespoon of sugar, and nutmeg together and pour into baking dish. Combine the remaining sugar, flour, triticale flakes, hazelnuts, cinnamon, and ginger in a large bowl. Rub the butter into the sugar mixture until small clumps form when the mixture is squeezed and the butter in is pieces no larger than a pea. Chill in freezer for 10 minutes. Sprinkle sugar-butter mixture over the apples and bake until the top is golden brown and apples are bubbly around the edges of the baking dish, 35 minutes. Serve warm with vanilla ice cream or soy ice cream. 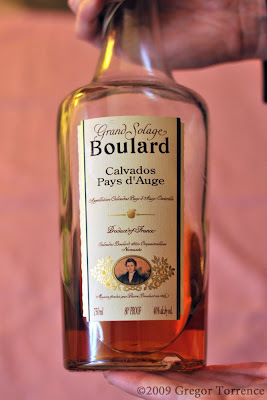 You had me at Calvados! I’m crazy for that stuff. Does look delicious. Made for cold evenings and even colder nights.